Two of the three parables Our Lord Jesus gives us in today’s Gospel deal with seeds. The seed is a image commonly used by the great Christian writers in their teachings on the spiritual life. At first glance, seeds are pretty insignificant looking things. Most are so small that they can be easily overlooked or mistaken for a lifeless pebble. It would really take an expert gardener to identify a particular seed apart from it’s plant or Burpee package. It would also probably take an expert to distinguish between a seed that would bear edible fruit and a seed that would bear a weed or poisonous fruit. But as plain looking and little as it seems, there is much more to a tiny insignificant looking seed than meets the eye. Place one in fertile, well watered soil, and in time the seed will grow into a large plant or even a giant tree that the birds of the sky come and dwell in its branches. Therefore, people who wish to grow something need to take seeds seriously, and also need to be able to distinguish good seed from bad seed. While not all of us may not cultivate a vegetable or flower garden, as Christians we must all be concerned with cultivating the garden of our soul. Jesus says that our soul is the field that he wants to plant the seeds of His Gospel in. And just as there are a multitudes of varieties of seeds in the world that will bring forth many varieties of good fruits, beautiful flowers, and strong and mighty trees, there are also a multitude of varieties of seeds Jesus wishes to plant in us which will in time transform our soul into a beautiful garden of virtue and charity. But while Jesus has many seeds He daily wishes to plant in us, we need to go to Jesus each day to receive these seeds into our souls. We also need to be wary of the seeds of the evil one. The seeds the devil sows can at times look very much like the seeds Jesus sows. They are also small and insignificant looking, and we might even be tempted into thinking that planting a few of the devil’s seeds here and there in our souls won’t be that harmful. But sin spreads like a weed in our souls, until before we know it it’s overtaking the good seed that was sown. The weed then becomes the largest of trees in our garden, that crows and vultures make their nest in. Jesus also comments in the first parable that while they were asleep (the) enemy came and sowed weeds through the wheat. And so we must be vigilant in prayer, for when stop cultivating the Garden of our souls with the good seeds of Christ, the devil will pick up where we left off. May Jesus in this Eucharist help us to recognize and value the many varieties of seeds he sows in our heart and to distinguish them from weed baring seeds, so that we may yield a rich harvest of grace throughout our lives. No homily this weekend . . . . I am on vacation up in Maine. 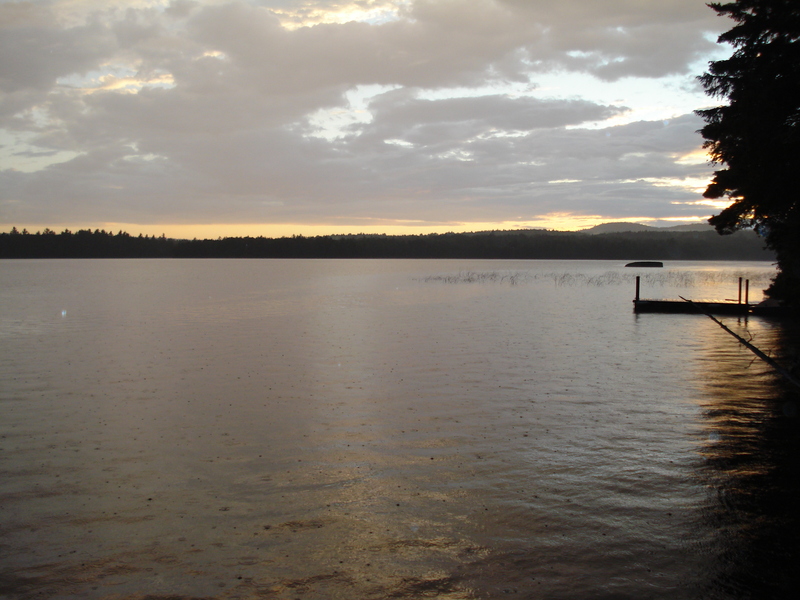 Here is a photo of the Lake my cabin is on. A picture can be worth a thousand homilies, depending on the preacher! Jesus says to us in the Gospel today Come to me . . . .and I will give you rest. We simply need to just come to Jesus, and rest will be given us. No matter how weary we are, no matter how heavy burdened we are, no matter how hard our labor has been, Jesus will give us the rest our soul is longing for. And coming to Jesus is not difficult or burdensome; to come to Jesus is easy, and the burden it will entail for us is light. For we come to Jesus every time we celebrate the sacraments. Jesus is always present to us in the Holy Sacrifice of the Mass, and in the Holy Eucharist Jesus is here 24/7 in the Tabernacle. When we come to Jesus truly present in the Blessed Sacrament, he will always give us the rest our souls need. We also come to Jesus in the Sacrament of Penance, placing before him the sins that burden our soul and cause our conscience such unrest. And Jesus in the confessional gives us rest, the rest of a clear conscience, the rest of being reaffirmed that each of us is a child of God, redeemed by the Precious Blood of Christ. And throughout the week, we can come to Jesus wherever we are, through daily meditation on the Scriptures and lives of the Saints, even through little acts of faith hope and love throughout the work day. Whenever we lift our hearts to pray, we come to Jesus, and Jesus always gives His rest to those who come to Him. And finally, we come to Jesus whenever we perform one of the works of Mercy, whenever we show a selfless act of charity towards another person. If we help carry our neighbor’s burden, Jesus will give us rest from our own burdens. Come to me, and I will give you rest, says the Lord. But why is it then, that sometimes we do come to Jesus in these ways, but seem not to get any rest from Him? If all one needs to do is to come to Jesus, why are so many people still so rest-less? The answer is that Jesus does give rest to everyone who comes to Him, but that this rest is hidden from the wise and the learned; that is to say those people who are wise and learned in the ways of the world, those who St. Paul would say live by the flesh and not by the Spirit. Jesus says come to me, and I will give you rest, take up my yoke and learn from me and you will find (the) rest I give you. The wise and the learned of the world, who live by the desires of the flesh aren’t child-like enough to learn from Jesus. And so, while Jesus gives them rest whenever they come to Him in the Sacraments, in prayer and even in good works, they can’t find this rest because it is buried under their pride and worldliness. In contrast, it is the the little ones, those who aren’t wise and learned in the ways of the world, the child-like who live by the spirit and put to death the desires of the flesh, that Jesus reveals the mysteries of the Kingdom to. So let us ask Jesus to help us not only to come to Him, but most importantly to take up His yoke and learn from Him — to take up our Cross by embracing the daily trials of life, and to learn what Jesus is teaching us in the present situation we find ourselves in. Through this Eucharist may Jesus give us the rest our souls so desperately need, and may we find this rest Jesus so desires all of us to have by taking on our shoulders His gentle yoke and learning more from Him each day what discipleship entails. You are currently browsing the fatherwoolley.com blog archives for July, 2008.